We all want only the best things for our children. Remodelling a room for your kid is a lot of work, especially if you want to get every detail just right for your little one, from choosing the perfect color for the walls to carefully selecting the toys to decorate the space. However, floor is often neglected and chosen without much consideration – a misstep both parents and children could end up paying for. Choosing the right floor for your kid’s bedroom will not only benefit your child’s development throughout the years but also leave you with more free time and give you peace of mind when leaving your child alone in the room. Striking a balance between your child’s needs and the floor’s maintenance requirements is easily doable as long as you know what elements to take into consideration and where to compromise. You kids may be the one making a mess of their room but it will definitely be you who has to clean it all up (at least for the first couple of years). Food crumbs and occasional paint on the floor is a common occurrence in a household with a child. Choosing a floor that is easy to clean is the best thing you can do for your future self. But refrain yourself from going straight for the most expensive kind. Children are a force of nature. As charming as it might seems to get the very best quality product for your child, it might be smarter to go for something cheaper, so if it’s ruined for once and all you wouldn’t have wasted all that money. Besides, you can always replace it with something fancier when they are older. Comfort is a topic with split opinions. Parents care about a lot when children couldn’t care about it any less. Even if kids are ready to roll naked and run barefoot on a cold tile flooring, it doesn’t mean you should let them. And admit it, playing with your kids on the hard floor would be a lot less nice than a warm cushioned surface. For children, the whole world is a playground. They learn by doing and they do it all: crawling, walking, running. They also fall a lot. This is why having a soft surface to break a fall is a recommended feature to have in a kid’s bedroom. The perfect floor would be strong enough to endure scratches from scattered toys and spills of drinks while at the same time being cushioned enough to make tumbles less painful. If you don’t want to risk your child being affected by an allergy, choose flooring with anti-bacterial properties. Being a parent is a lot like being a superhero. You have to plan ahead a lot and come up with solutions for problems that don’t even exist yet. Too bad you can’t time travel. But fortunately, you can consider flooring options that are durable and can endure different age groups. Once you have an idea what the requirements are, you can move to selecting the floor itself. Here’s an overview of different flooring materials that fit the bill. Wood is a natural material. Harvested straight from the forest and having undergone only the very minimal amount of treatment before ending up as flooring boards makes it a highly unlike culprit for any kind of allergies. Both, solid and engineered wood floors have a hard surface and aren’t as bouncy as other flooring materials. Fortunately, it’s not something that can’t be fixed with a carpet. Using designated area rugs is also a great solution for common spills. Because of their smaller size, it’s easier to wash or completely replace them. 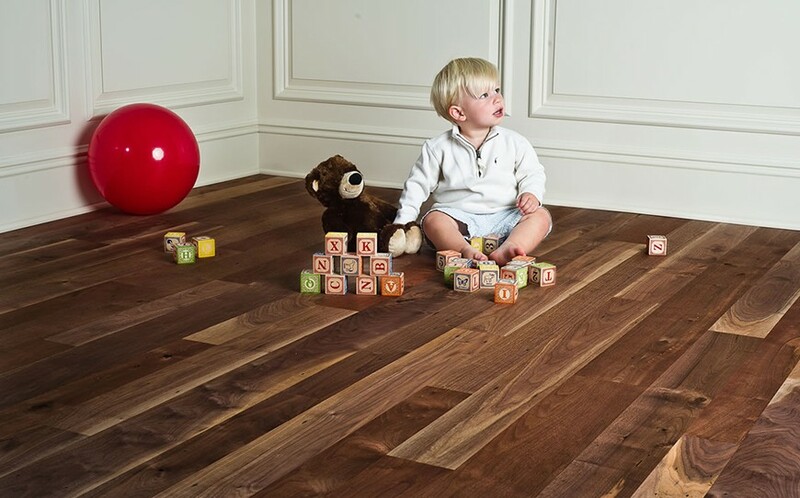 The hardwood floor, however, will keep its reach look well into your toddler’s teenage years. If you want your kid’s room to have the rich look of a wood floor but a softer touch laminate is a great choice. High-quality laminate floors can realistically mimic any wood texture while it’s foam underlayment ensures a certain softness or bounce that other hard floors don’t have. Extra protective surface makes your laminate flooring 10 times more resistant to scratches and up to 100% water resistant. The look isn’t the only thing laminate flooring shares with hardwood floors – it’s also pleasantly warm to touch. Highlight: Looks like real hardwood floor but feels softer. Vinyl has it all. It’s often referred to as resilient flooring and rightfully so. The main material being rubber it’s softer and makes walking on them more comfortable (and quieter!). Most luxury vinyl floors are 100% waterproof and very resistant to scratches and stains. Needing no more care than tile floor, they deliver a much more pleasant flooring experience. There is a great variety of patterns and textures available, some of them as good as indistinguishable from the natural materials they mimic. Some vinyl floors even offer a special coating that hinders the growth of bacteria and fungi by 99.9% making the maintenance process even easier and guaranteeing a healthier and fresher environment for your little one. Highlight: Top resilient flooring with a natural look and antibacterial coating.